Swedish cellist Frans Helmerson studied in Göteborg, Rome and London with Guido Vecchi, Giuseppe Selmi and William Pleeth, as well as having had the benefit of guidance and support from Mstislav Rostropovitch. Helmerson has performed with many of today’s finest conductors such as Seiji Ozawa, Colin Davies, Neeme Järvi, Evgeni Svetlanov, Esa-Pekka Salonen, Herbert Blomstedt, Sergiu Comissiona, Rafael Frübeck de Burgos, Kurt Sanderling and Mstislav Rostropovich as well as with a number of the major orchestras, touring throughout Europe, the United States, South America, Asia and Australia. 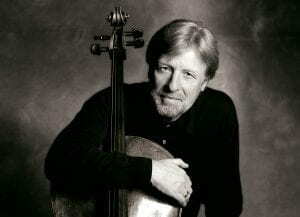 Helmerson’s love for chamber music led him to take the position of artistic director of the Korsholm Festival in Finland (1994-2001), and he frequently appears at a number of international festivals such as in Verbier, Prades, Naantali, Kuhmo and Ravinia. In 2002 he formed the Michelangelo String Quartet with Mihaela Martin, Stephan Picard and Nobuko Imai. Helmerson has recorded concertos by Dvorak and Shostakovich, the Brahms Double Concerto with violinist Mihaela Martin, and the Bach Solo Suites, among others. Frans Helmerson previously held a professorship at the Musikhochschule in Cologne. He now teaches as guest professor at the Hochschule für Musik Hanns Eisler Berlin and as professor at the Kronberg Academy Masters.